This Brief examines the role of Police Unions in law enforcement policy development. It provides an overview of the historical and political background of police labor unions, and takes a critical look at the shifting perception of labor unions from generally positive to somewhat negative, to compare this perception with their real impact. It examines the perceived role that unions play, whether positive, negative, or neutral in the development and advancement of contemporary law enforcement agencies and their respective policies. This work provides a multisite survey of police administrators’ views and opinions on police union impact on a variety of police functions including: delivery of services, prevention of crime and disorder, and interaction with the public. The results of this research provide a comprehensive look at ways to improve the ways police departments operate and how they improve and enhance legitimacy in their communities.It provides a context for the current state of the public sector labor relations environment. It will be of interest to researchers in criminology and criminal justice, police science, and public policy. Police administration, Police -- Labor unions. 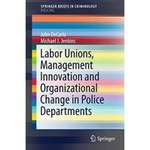 DeCarlo, John and Jenkins, Michael J., "Labor Unions, Management Innovation, and Organizational Change in Police Departments" (2015). Criminal Justice Faculty Book Series. 1. DeCarlo, J., & Jenkins, M. J. (2015). Labor unions, management innovation, and organizational change in police departments. Cham: Springer.